Park Güell is certainly one of the most famous sights of Barcelona. The with split ceramics decorated winding bank above the by Roman temples inspired market hall is world famous. Gaudí has created a fabulous forest with this park. Take a little time to be enchanted by the Park Güell. all year round Wednesdays, Fridays and Sundays always at 9:00 a.m.
no guided tour on the 1st of January, 25.12. and 26.12. The booking is very simple: enter the number of persons on the right side, select the date and time and click on "Add to cart"
You will receive the binding booking confirmation with detailed directions within 48 hours. Side entrance of Park Güell at Carretera del Carmel. With the booking confirmation you will receive detailed directions. Please be at the meeting point about 15 minutes before the start of the tour. Please arrive around 15 minutes before the beginning of the tour at the meeting point in front of Gaudí Experience 4D, c/ Larrad, 41. The Gaudí Experience is about 200 metres away from the park. We will check the availability and you will receive a booking confirmation and the ticket with the access number by e-mail within 48 hours after the booking. With this access number you can get into the park. Access is only possible in a time window of 30 minutes after the booked time. For example, if you chose 9:30, you can enter the Monumental Zone from 9:30 to 10:00. After you entered the Monumental Zone you can stay as long as you like. The landmark of the park is a friendly dragon, watching over the entrance of the market hall. You will encounter the dragon when you enter the park through the most beautiful entrance, the main entrance: Coming from the south side, walk from Carrer d'Olot between two turreted pavilions to a staircase. Here the friendly guardian of the park welcomes you. He is also decorated with broken pottery, the so-called Trencadis. The pavilions and the organic shape of the terrace clearly show the signature of Master Gaudí. From the staircase you get to a very unusual room. Consisting of 86 columns, it was originally thought of as a marketplace of the residential area - the original purpose of Park Güell. The hall, with a forest of Roman-inspired columns, supports the main eye catcher, the large terrace. The allusion to Roman temple refers to a Roman road that led here. The columns worn by the terrace are bordered by a fraction ceramic excessive balustrade with a bench. This bench is world famous. Salvador Dalí called the bench once the precursor of surrealism. Colourful like children's toys it winds in snake-lines, creating small niches and gives a splendid view over the city. The park, high above the city, must have been a particular challenge for Gaudí. Here, he had the opportunity to create his natural art with nature itself. The result is a Mar Cheng species, influenced by tiny details. The actual green areas of Park Güell are carefully in the landscape integrated an full of a maze of trails, courses, walls and bridges. For the tour of the park you should bring a lot of time, because there are many details to discover. After walking the park we recommend visiting the Gaudí Museum in his former residence. The museum is about 200 metres eastern from the main entrance. Barcelona's famous Art Nouveau architect, Antoni Gaudí, has built the Park Güell as a tribute to nature. In 1885 Gaudí's patron, the industrialist Eusebi Güell, acquired the terrain on a mountain ridge, with a fantastic view of Barcelona. In 1890 Güell instructed the architect Antoni Gaudí to build a garden city, in which nature and an equal housing should form a symbiosis. In addition to the Sagrada Familia, this was the largest project of Gaudí. Only two buildings of the 60 villas, the roads and the extensive park were finished. The park was opened in 1922. In 1929, the year of the second World Expo, the park was handed over to public. In 1963, the former residence of Gaudí was opened as a museum. In 1984, the park was included in the UNESCO list of cultural heritage. Gaudí created an enchanted forest with the park. 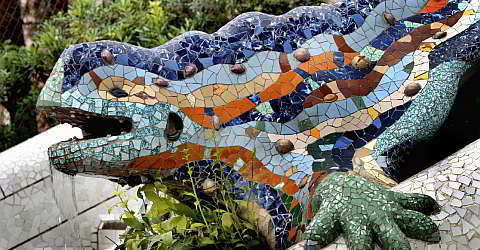 Take some time to be enchanted by Park Güell and discover the many small details. From March 2019, there will be a shuttle bus to the Park Güell, which will relieve the public transport and offer guests a comfortable journey.The shuttle bus starts at Plaça Alfons X and you can easily get to this place by taking the metro line L4 (yellow line). From March to October, the bus runs from 7:45 to 21:45 every 7 minutes. From November to February, the bus leaves every 9-10 minutes from 08:00 to 18:45.The "Bus Güell" stops at the upper entrance of the park on the Carrer Carmel. The bus is included in the ticket price.At Plaça Alfonso X. there is an information center for Park Güell. We recommend the use of the "Bus Güell" to get to the park. This is much more efficient than the small district buses that drive past the park. With the metro L3 go to the station Lesseps. From there it's about 10-15 minutes by foot. From the station walk along the main road Travessera de Dalt (Don't follow the large signs) until you reach the street "Avinguda del Santuari de Sant Josep de la Muntanya" on the left side of a road. Walk along this road all the war to the end, when you reach Carrer d'Ot. From there you can see the entrance already. If you follow the large sign, you can reach Park Güell through a side entrance, an escalator takes you up the mountain for the last metres. You can leave the park at the main entrance and go back the way as described above. About 95% of the park area is accessible free of charge, only the monumental zone isn't. This zone covers the entrance area with the dragon, the curved bench and the market hall. Only 400 visitors are allowed here per half hour. Tickets are available at the box office or online. With the ticket you can go into the monumental zone in a certain period of time and then stay as long as you like. Please consider that you might have to wait to get a free time period if you buy the tickets at the box office. We therefore recommend to book online. The prices above are more favourable online prices. Park Güell is certainly the most impressive park in Barcelona. The paths through the green areas are beautiful and can enchant you. Today it is incomprehensible that nobody wanted to live here 100 years ago. You can go for a long walk here, in the summer the park is nice and cool. From the park you have a great view of the city all the way to the sea. In the Monumental Zone you will find landmarks of Barcelona with the friendly dragon, the market hall and the winding bank. With Park Güell you will experience a fantastic park that is fun and in which you can discover a lot. Let a guide show you the Park Güell and the Monumental Zone. Please choose the date and enter the number of people that you would like to book for. Please note the available times. Please select the date for your Park Güell tour. Please enter the number of tickets, the date and time of your visit. We charge an additial fee of €5.90 per booking. Admission fee only for the monumental Zone. The rest of the park is free. Schedule about 1.5 to 2 hours for the visit.